Samuel Issacharoff, the Bonnie and Richard Reiss Professor of Constitutional Law, delivered his inaugural lecture, “Fragile Democracies: Elections and the Rise of Extremist Parties,” on October 30, 2006. He reminded the audience of the violent riots and outraged calls for censorship that had erupted the year before when the conservative Danish newspaper Jyllands-Posten published cartoons depicting the prophet Muhammad in an unflattering light, and then asked them all to imagine that something else had happened: What if, instead, the protesters had formed a political party and fomented a movement meant to wreak havoc from the inside out? “There is a haunting quote from the Nazi Joseph Goebbels that puts this absolutely perfectly,” said Issacharoff: “‘This will always remain one of the best jokes of democracy—that it gave its deadly enemies the means by which it was destroyed.’” Therefore, Issacharoff noted, in order for democracies to thrive, a shift from absolute protection of free speech is sometimes necessary; oversight bodies need to judge whether a group’s political viewpoints (and actions) are truly dangerous or not. He also argued that administrative measures taken by agencies in order to shut down malevolent groups are essential to a democracy’s well-being. 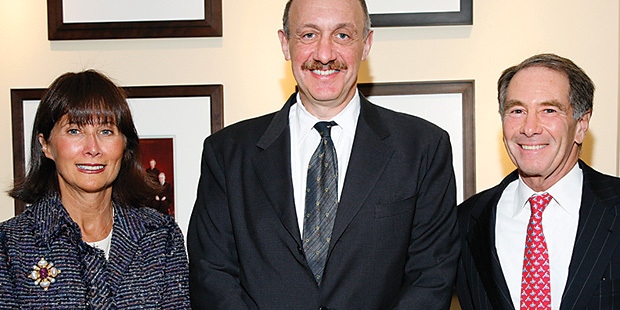 Issacharoff was careful to make a distinction between American democracy, where the criminal-justice system is the mechanism used to deal with spoilers, and other nations, where the brakes have a much better chance, because of the use of proportional representation, to become part of the government’s infrastructure. “Most countries do not use the criminal code as the primary regulator of the political process,” Issacharoff said, mentioning Germany, Russia and Turkey, where constitutional amendments disallow fascism, communism and sectarian rule.